Here at Origin68 we like to make our stationery that little bit more special. As you know, we work hard to produce everything as sustainably as we possibly can, including the packaging that your shirts arrive in. We have always printed on recycled papers, and use biodegradable mail bags to ship our orders in. We also pride ourselves on not filling your packages full of things that more often than not go straight in the bin (postcards, flyers etc). We believe that if these things (which people readily discard) are going to end up in landfill, then they should at the very least be made from materials that will degrade over time. That's why we're please to have found these new seeded paper hang tags. The paper these are printed on are loaded with seeds, which, when discarded (or planted carefully by you) will turn into beautiful flowers. What could be better than that?! We hope you like them. If you get one in the post and decide to grow yours, then please send us a photo! We would love to see the results. We might even offer a prize to the best grower. 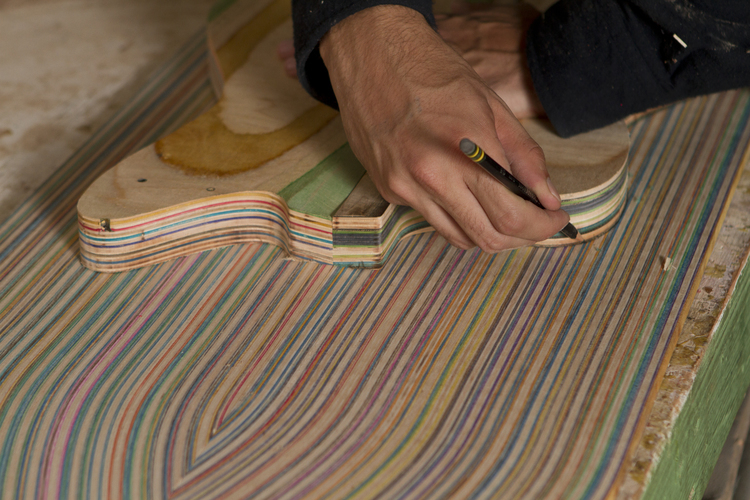 Handmade guitars made from recycled skateboard decks. I don' t know how things are in your neck of the woods, but here in Origin68 land (Manchester, England in reality) things are hotting up nicely. Gone are the driving blizzards and avalanches! It's defintely feeling more springy to us... seasonally speaking, not coiled metal. Summer is almost upon us and we're thinking about going away and enjoying the great outdoors... but wait, my eyes need some kind of protection from this blazing ball of plasma dancing across the sky! Introducing our new sunglasses. Available in both a vibrant blue design, with red highlights and a distinctive black design with green highlights, but both with polarised lenses. Inspired by the '80s Wayfarer style, coloured and constructed from repurposed skateboard decks. Good news for old broken skateboards everywhere! These are handcrafted from an upcycled cut of 5-ply Canadian maple wood. Polarised UV400 smoke black lenses Offers 100% UVA & UVB protection (safety first) Spring hinged, universal fit 100% water resistant Unisex design to fit anyone and everyone Arrives with a travel pouch to keep your shades safe, snug and spotless. Our second new addition to the shop is Woodbud wooden noise cancelling earphones. These little beauties are small, simple, sustainable hardwood, noise isolating in-ear headphones. Distinctive design combines superior sound quality, premium comfort, with a small carbon footprint. Woodbuds are lightweight, made using natural walnut, crafted the right way – designed to make a difference. We have these available in black and white, to suit all your monochromatic needs! We absolutely love these.